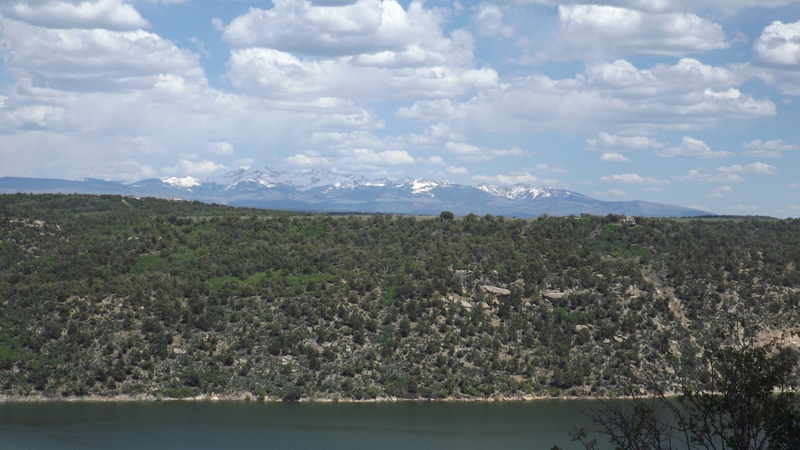 Roughly four miles northwest of Dolores, CO lies a lovely little Federal campground known as McPhee Reservoir. You want to book your reservation on the Pinon Loop because it’s the one with water spigots and at some sites, voltage. The dump station has not worked for a year or so (insufficient funding), but there are a few full hook-up sites you can drain tanks into when they’re unoccupied for only $5. 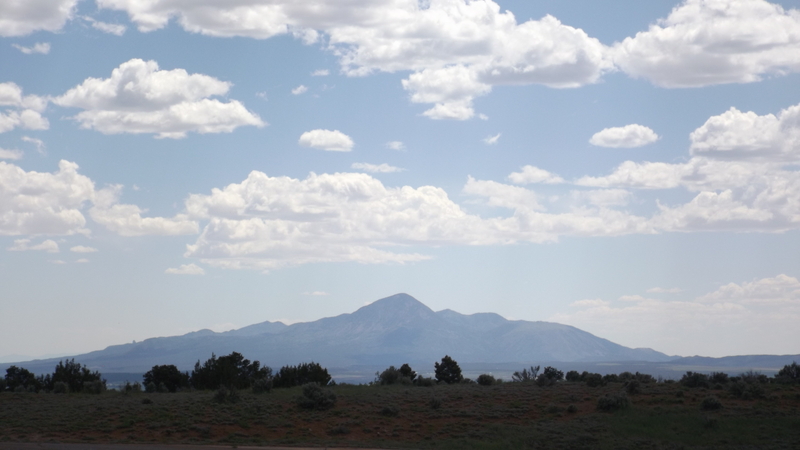 You will have mountain views over 180 degrees, and birds and wildlife do well here. We have seen mule deer (big deer with huge ears) and so far no ticks. 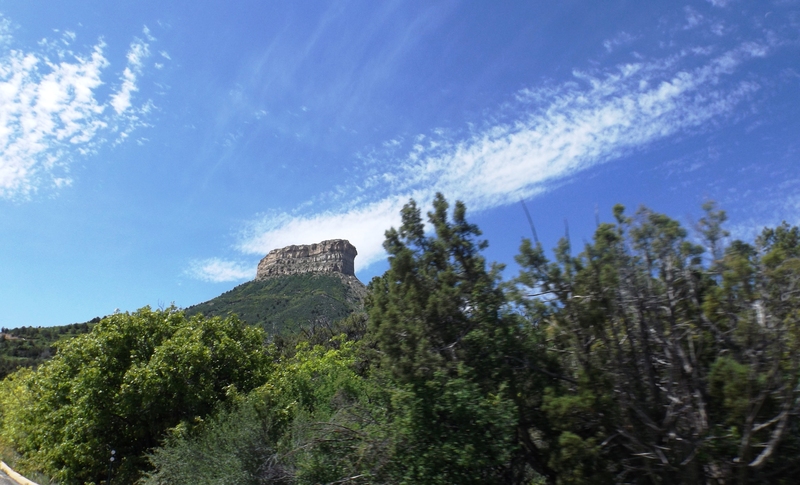 Mesa Verde National Park is about 25 miles away with an asterisk: the gate and the Visitor’s Center are 25, but the cliff dwellings are another 20 miles in on a scenic drive, unless you are the driver. Local legend has it that somewhere around 1905 Teddy Roosevelt was hunting in the Dolores River valley and proclaimed “This is a bully site for a reservoir! Make a note of that.” But at that time the valley was covered with mature Ponderosa pines, a resource then more precious than water. The land should be logged first, and since it was owned by the Federal government, the timber rights were sold a few years later by the US Forest Service (after Teddy invented USFS to rationally sell and then replant Federal woodlands that heretofore had no protection.) In 1924 the McPhee Lumber Company built a company town (imaginatively named McPhee) pretty close to what is now the deepest point in the McPhee Reservoir. Company towns did exist; they are not a fiction of Bernie Sanders supporters. The company built, owned, and rented the houses. The company operated a store that took company scrip or cash. The company paid its workers 40% scrip good at the company store, and 60% cash. The company hired a doctor and set up a clinic. The company built a narrow-gauge railroad to haul logs to the big mill in McPhee. The company was wildly profitable for a few years, and then came The Great Depression. Trucks came along to compete with the railroads. McPhee Lumber bet wrong on railroads and on the quality of those old Ponderosa pines. Trucks proved more cost-efficient, and the pines grew so close together that few made good lumber. But the company wouldn’t quit: lumbering operations continued on a reduced scale until 1948 when all the trees were all gone. The dam was completed in 1985, and the Dolores River filled the lake creating Colorado’s second largest lake holding enough water for Montezuma County to provide for a hundred years of growth. Think of that: over a hundred years after ol’ Teddy’s dam insight, the high desert towns Cortez and Dolores have the water to grow another hundred years. On Memorial Day, McPhee was covered with fishermen, kayakers, and water skiers. I wish we had photos from their unobscured view of those snow-capped mountains from a boat in the middle of the lake. It’s a regional treasure.